There comes a time during practice when you are ready to just bask in the warmth, energy, and awe of the union that you’ve created with the practice. One of my favorite poses to break out for this is Camatkārāsana or Wild Thing. Camatkāra translates to “producing wonder” or “astonishment”. Yoga Journal defines the pose name as “the ecstatic unfolding of the enraptured heart”. It makes you want to experience the pose right now, doesn’t it? Keep this pose in mind the next time you are ready to bust open your heart. 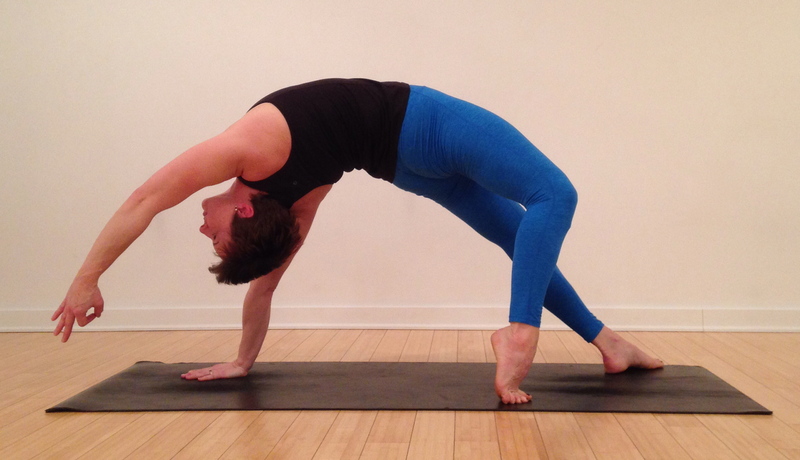 Sometimes called “flipping your dog” (not quite as poetic), this heart opener is also a great counter to a practice with a lot of core work or coiling actions, which we find regularly in Power class. While it’s less intense than some backbends, it’s still important that your spine, shoulders, and front body are prepped and ready to be ecstatically opened along with the heart. Supporting the body on one arm and shoulder, and transitioning into the pose can be challenging. If you have any shoulder or rotator cuff issues you should avoid this posture. Try these stages of the pose to explore producing wonder and astonishment with your yoga practice. Option 1 – Kneeling. From a kneeling posture, extend one leg and place the opposite hand on the mat. Start with a side stretch, maximizing the length of the body. Then, turning the heart to the ceiling, reach the arm away to maximize the stretch and openness in the chest. Keep the grounded shin and extended leg active. Notice if there are any issues or discomfort with the supporting shoulder. Option 2 – Three-Legged Hip Opener. From downward facing dog, lift one leg, bend the knee, then stack and open the hips. Hug the heel to the glute and raise the knee as high as you can to open the hip flexor and quad. Work with both keeping the shoulders square and turning them toward the side wall. Find balance and grounding in this asymmetrical configuration. Option 3 – Preliminary Wild Thing. When you are ready, continue to reach the raised foot until you come to fingertips, then teeter off the hand on the same side. Reach the foot to the mat about mat width. If the hips or heart dipped during the transition, lift them toward the ceiling. As much as the shoulder allows, turn the heart toward the ceiling, reaching the heart into the hand. To exit, sit the hips down or flip back to three-legged dog. Option 4 – Full Extension – As you progress, work to keep the supporting leg straight, and keep the lift of the heart and hips as you flip. The foot of the leg that flips will ground on the the ball of the foot with a big lift of the heel. 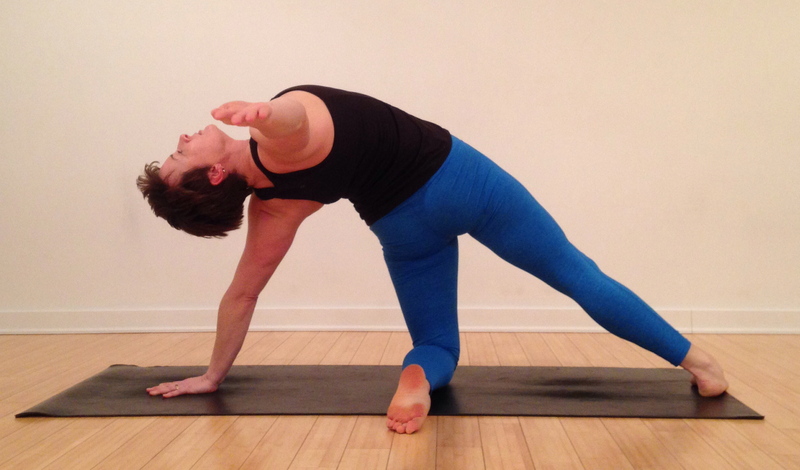 Reach the arm overhead to accentuate the backbend. The reaching hand can be held in jnana or chin mudra, symbolic of yoga in action or the union of mind, body, and spirit. Bask in the estatic opening of the heart. It’s hard to feel ecstatic if you are struggling or fighting, so be mindful to work where your can relax and breathe in the pose. Follow along @suzannewrightyoga on Instagram or at Suzanne Wright Yoga on Facebook. If you post your pictures or about your experience be sure to tag #PowerPose and @suzannewrightyoga.